Attendees of the Desert Woodturning Roundup will see many exciting products at the many Vendor Booths, including the latest turning tools and supplies, specialty woodworking tooks, and domestic and imported hardwoods. Many of the vendors offer substantial discount prices to Roundup participants. Plus, if you buy at the Symposium, you can save shipping costs! Airbrushing Wood carries the full line of GREX airbrush products as well as Private Stock acrylic airbrush paints. GREX airbrushes provide the best value for a quality airbrush. They provide versatility, ergonomics, ease-of-use, and great service. 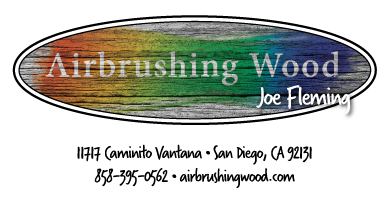 Private Stock paint is the finest airbrush paint for woodworkers on the market today. It provides a durable, lightfast color for your projects. Century Tree Turnings has all of the Wood Turning Blanks for your woodworking needs. Whether you're a beginner or have been turning for years, we'll be able to assist you in your wood selection. Don Jovaag is a segmented turner. He has written a book on segmented turning, which will be for sale. He will also be selling his segmented turnings: bowls, platters and bangles. The AFFORDABLE Vacuum Pump and Chuck, half the cost of a venturi pump, 1/5 the cost of any other commercial set-up. Save money and time finishing your platters and bowls. No more time consuming set-up with Cole Jaws or jam chucks. Kallenshaan Woods is a family owned, unique laser cutting and engraving business located in Las Vegas, Nevada. After designing and creating the first laser cut inlay pen kits in 2003, we continue today to make that our main focus. Over 150 laser inlay pen kit designs are currently available. We offer personalized maple pen boxes, excellent customer service, and quality workmanship. Your craftmanship plus our wood! Bowl turning blanks, natural edge slabs, and spindle turning billets. Larry and Sara Cornwell produce and sell their wood carvings and decorated gourds. "Power Carving" rotary tools featuring long-lasting, razor-sharp carbide cutting teeth arranged into a unique open pattern to resist "loading" while providing rapid stock removal and smoother finishes. Timber Woodworking is providing all the demo lathes for the Roundup! Helping you make wood work! A vendor for woodturning lathes and tools. Stuart Batty will be demonstrating at this vendor booth! To become a DWR Vendor, visit our Vendor Registration page.